As a wedding photographer I know that besides the light, posing an emotions, a good background adds more value to my images. After the couple's first look, I took them for quick photo shoot on location. This image, is the result of that and was captured before the outdoor wedding ceremony at Château Le Parc. This image features the bride and groom holding hands and kissing. The are flanked by three high end sports cars. Next to them is a red Ferrari. On the left, we have a white Porche, and on the right there is a Lamborghini. The cars on the side point towards the as if they are their spectators at this show of love. The composition is symmetrical with the bride and groom positioned in the center, towards the bottom of the frame. 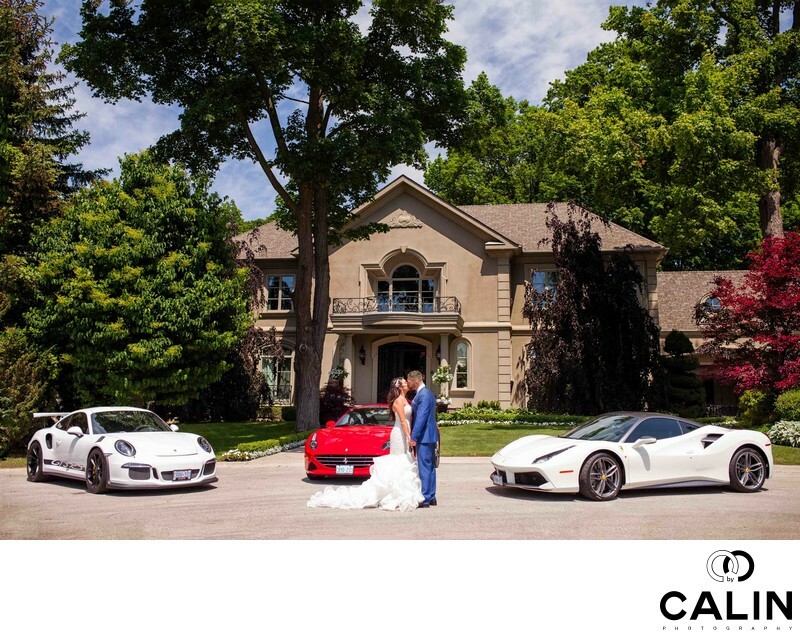 The red Ferrari draws the viewer's attention towards the centre of the image, while the cars on the left and the right of the photo, complete the sense of symmetry; their bodies point towards the bride and groom creating leading lines that emphasize the importance of the couple in the picture. The collar of the cars also match or complement the couple's outfits in the photograph looks like a painting well thought through and designed. This is one of the final shots we took at this location. Soon after we headed towards a park and then to the wedding venue for the outdoor ceremony.